CushionMaster II is a 100% acrylic emulsion coating fortified with coarse rubber particles. It is used for base coats to achieve higher build for the Cushioned Tennis Court Surface system. CushionMaster II is designed to slow and cushion play for greater player comfort and enjoyment. Approximately .15 gallons per square yard per coat. CushionMaster II is designed as the base layer for the SportMaster Pro Cushion System. CushionMaster II features coarse rubber particles for higher cushion build. Additional coats can be added to increase the level of cushion feel in the cushioned tennis court surface system. 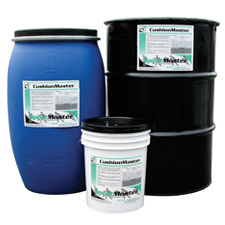 The CushionMaster products are formulated with flexible, elastomeric binders that stay soft and pliable as they age. Unlike other traditional acrylic binders, this helps to maintain the soft feel of the cushioned tennis court surface for many years. As with a standard SportMaster System, surface preparation is extremely important. The surface must be smooth and level. All pavement repairs must be flush with the surrounding surface. The pavement surface must be cleaned entirely of dust, dirt, debris and all loose materials. New asphalt surfaces must cure 14 to 30 days prior to application. Newly cured or rough textured asphalt surfaces should first be coated with Acrylic Resurfacer (Technical Bulletin CMT-3). New Concrete surfaces must cure 28 days prior to application. Concrete surfaces should have a medium broom finish or similar roughened texture. They must never be steel trowelled. Etch surface with phosphoric acid and apply SportMaster Acrylic Adhesion Promoter. Dilute 4 parts CushionMaster II with 1 part water and mix to a smooth, even consistency. Additional water may be required to facilitate application in higher temperatures. Apply mixed CushionMaster II with a soft rubber squeegee. Do not apply additional coats until preceding coat has completely dried. Three to five coats are recommended for standard resiliency. Stir before using. Temperatures must be above 50 °F both during application and for a period of at least 24 hours after application. Do not apply if rain is imminent or forecast. Keep from freezing. Close container when not in use. On outdoor concrete surfaces, assure adequate and functional perimeter drains as well as a sound vapor barrier beneath the slab. Three to four (3 to 4) hours under optimum drying conditions. Indoor applications are substantially affected by temperature and available ventilation and will dry more slowly. Due to the softer nature of cushioned tennis court surfaces, it is important to protect the surface from damage. Benches and other heavy items may leave dents in the court surface. Boards, mats, or other forms of protection should be used to spread out the weight of equipment and minimize the potential of damaging the cushioned tennis court surface.